Reflections: What “pushed” New Horizons slightly off course? According to mission navigation team members from KinetX, Inc., it was a tiny amount of force created from thermal photons from New Horizons’ radioisotope thermoelectric generator (RTG) power source - reflecting off the backside of the spacecraft’s high-gain antenna. A short but important course-correction maneuver kept New Horizons on track to reach the “aim point” for its 2015 encounter with Pluto. The deep-space equivalent of a tap on the gas pedal, the June 30 thruster-firing lasted 35.6 seconds and sped New Horizons up by just about one mile per hour. But it was enough to make sure that New Horizons will make its planned closest approach 7,767 miles (12,500 kilometers) above Pluto at 7:49 a.m. EDT on July 14, 2015. Commands for the preprogrammed maneuver were transmitted to the spacecraft’s computers on June 24; the burn went off as planned Wednesday at 3 p.m. EDT. New Horizons was more than 1.49 billion miles (2.4 billion kilometers) from Earth at the time of the maneuver; at that distance, nearing the orbit of Uranus, a radio signal from the spacecraft needs more than 2 hours, 13 minutes to reach Earth. Mission operators at the Johns Hopkins University Applied Physics Laboratory in Laurel, Md., received confirmation of the successful firing through NASA’s Deep Space Network antenna station near Madrid, Spain. The New Horizons propulsion system uses hydrazine, an efficient “monopropellant” fuel used on many satellites. (Monopropellant means the fuel burns without the help of a separate oxidizer.) For extra efficiency the fuel on New Horizons is heated before it’s burned. This was the fourth trajectory correction maneuver, or “TCM,” since New Horizons launched on January 19, 2006. 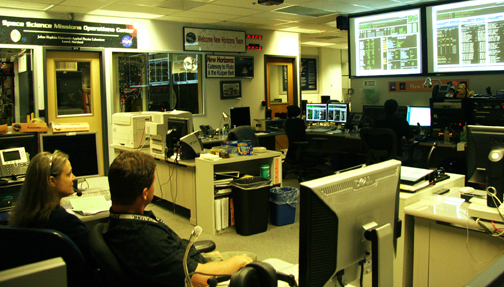 New Horizons mission operations team members at the Johns Hopkins University Applied Physics Laboratory await confirmation of a successful course-correction maneuver.